In a move that smacks of increasing desperation, the Government has linked the creation of a national cycleway to the building of HS2, the Government’s proposed £50 billion high speed railway. The Prime Minister announced a “feasibility study to look into creating a new national cycleway broadly following the route of the HS2 rail line”, along with a package of other measures designed to promote cycling. Stop HS2 campaigners accused the Government of spin and greenwash. “This is clearly another attempt by the Government to try and sell HS2 to a different set of voters. The money they have announced for cycling is only a fraction of a percent of the HS2 bill. “The Kenilworth Greenway route from Kenilworth to Berkswell [ part of the Sustrans Connect2 ] including a link to Warwick University now has hundreds of users, running, cycling, walking, and riding. It includes the 40 mile “A Coventry Way” Challenge. HS2 will sever the University route and it will be obliterated from Burton Green to Berkswell. Locals are devastated, and have been calling for a deep bore tunnel to keep the route and Burton Green in tact which will also be severed. “In Offchurch HS2 would cut right across the Offchurch Greenway (a pedestrian and cycle route) and Sustrans cycle route R41. While both routes would probably be reinstated in some way, their current rural character and likely usage would be seriously compromised. “In this area, any cycleway following the route of HS2 would be totally unable to ‘link communities to work, schools and shops’ as the route bears no relationship to such local travel patterns. “This is a classic example of trying to put the gloss onto HS2. It would be totally impractical for cyclists. With the proposed HS2 route and no stations between London and Birmingham, the idea that this suggested cycle path will link stations to other facilities is barking mad. This is a big chance to create a National Cycle Network that will radiate across the Uk. HS2 will happen so make the most of its creation. This spin will evaporate just like fibre optic cable and water pipe. There already is a National Cycle Route. Unfortunately local authorities are left to maintain them and their funds are, in real terms, shrinking. I live near one and the local authority road transport man said they could not afford to maintain it to cycling standards. It is very well used by locals and people riding cross country. There has already been at least one very serious accident caused by the pot holes. Unfortunately my friend didn’t doesn’t live in Birmingham or London so Cameron’s scheme won’t help. You don’t honestly think the government is bothered about setting up cycling networks do you? This is a bit of bait for the real catch. Hook, line and sinker! Not in my backyard George Osborne bends hs2 round his home in the north Cameron no fracking where I live thank you . The Phoenix Trail is a cycle path built along a disused railway that wasn’t used enough. Two years ago in a letter to John Bercow I joked that like the Phoenix Trail, if HS2 was built and then failed we’d at least have a long cycle path between London and Scotland. 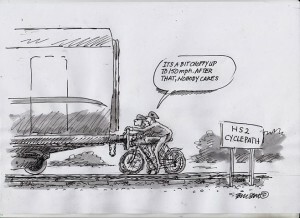 At that time there was no way I thought HS2 would happen, let alone an adjoining cycle route! Maybe I should have suggested using bicycles to generate the green power to run HS2 – it could employ thousands of gym enthusiasts! – How much would this cycle route add to the current width of the whole HS2 route? – As a result, how many more properties would have to be compensated for? – How much would this additional width add to the cost of HS2, or would these costs be covered by a new multi-billion HS Cycle Path budget? This is desperate spin –wouldn’t surprise me if they proposed that it should run between the 2 lines!